With the first half of the year showing somewhat slow results at the world’s major trade fairs, expectations were not running high for Market Week in Las Vegas this summer. And, for many, the slow trend continued. For others, however, business was looking up... on condition that orders are confirmed. Tanzanite, tsavorite, and diamond ring in 18K gold by Caroline C.
Two-finger ring in gems, diamonds and gold by Dionea Orcini. Multi-gemstone earrings in gold by Tomasz Donocik, winner of the Couture Award for Colored Gemstone Jewelry below $20k. Ring carved out of smoky quartz set with diamonds and citrine in 18K gold by Sanalitro. Tanzanite and diamond ring in gold by Benjamin & Co.
Multi-color "Margarita" ring in 18K gold by Philip Zahm Designs. Bridal takes on color, as seen in this diamond and sapphire ring by Saturn Jewels. Opal contrasts nicely with the darkened gold set with diamonds by Lauren K.
Winner of the Best in Platinum award at Couture, this innovative ring is from Christian Tse. Diamond and sapphire rings with a center that rotates on itself, giving two remarkable center sections by Jorg Heinz. Winner of Couture’s Editor’s Choice Award. 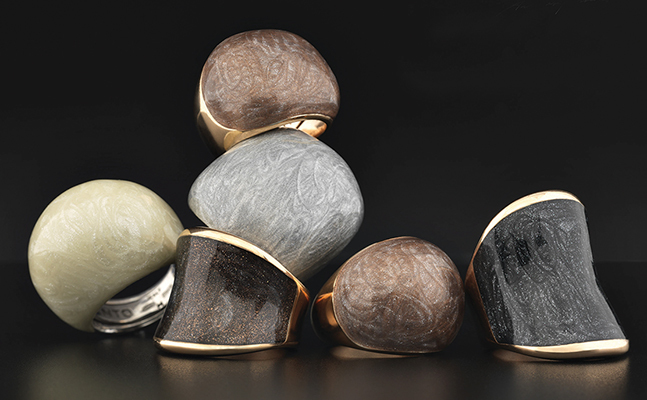 “Resolutions” triple ring in 18K gold and gemstones by Nada G.
The summer shows in Las Vegas, composed of Couture, JCK, and AGTA, have become a must-attend event on the global jewelry calendar. They attract buyers and press from around the globe who come to see the latest offerings from designers and brands, also from around the world. With expectations set at optimistic but cautious levels, the slight increase in buyer attendance was a welcome sign. But did it really translate into sales? According to a range of exhibitors, results were quite mixed. Some reported good sales or at least good interest and new contacts, while others were more muted in their comments. During the first few days of Luxury and Couture, the halls were buzzing, with a level of positivity not seen for a while. All good signs. But, as one exhibitor, which had many visits and a lot of interest, confided to me a couple of weeks after the shows, “Some orders were cancelled and others scaled back.” While sales may have been mixed, the creativity of the designs seen at the shows was definitely positive. The Exotic Earwear trend, encompassing ear climbers, cuffs, and jackets, continues unabated in a variety of materials. As does Finger Fashion with multi-fingered rings and full-fingered rings as well as rings attached to bracelets. Geometrics and open-work pieces are a definite trend in all types of jewelry. In terms of motifs, nature-inspired designs remain popular, as do edgy pieces. 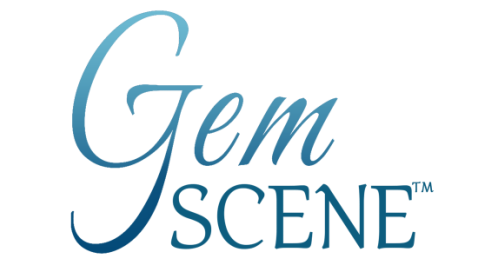 A vast array of gemstone jewelry could be found, although opal, tanzanite, and moonstone seemed to be among the favorites. Creatively designed open-ended collars and thin rigid necklaces also attracted attention. A few brands also presented unexpected or surprising pieces, with innovative techniques and designs. Smart jewelry is also coming into the mainstream, and we will talk more about that in a later article. Shown here are a few examples of interesting and creative pieces seen in Las Vegas. 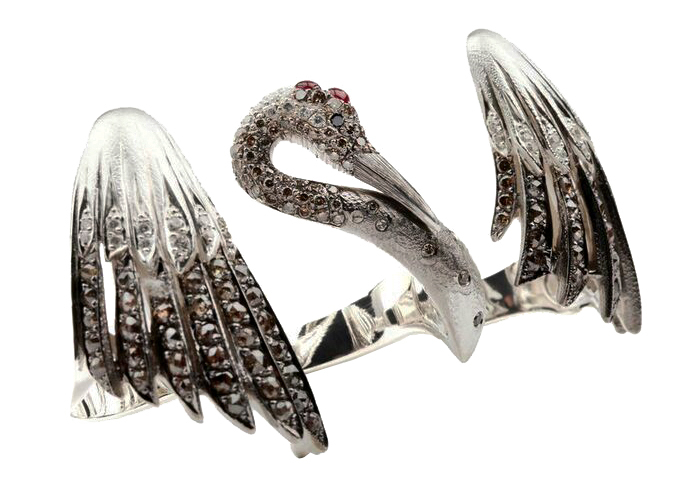 Full-finger ring in gems and 18K gold by Lydia Courteille. Ear climbers in amethyst and diamonds set in gold by MadStone. Jungle-inspired multi-gem and diamond ring by Zorab Atelier de Création. Bi-color tanzanite, white diamond, and rose-cut diamond pendant in gold by Vivaan. Ruby, sapphire, tanzanite and 18K gold earrings by Daria de Koning. A popular gemstone at the shows, opal was used in a variety of creative ways, such as in these earrings by Erica Courtney. New “Polvere” collection by Pesavento made of sterling silver covered with a special ‘dust’ using a proprietary manufacturing technique that utilizes nanotechnology to combine enamel with other natural products, creating varying colors and textures. Gold and diamond bracelet by Sorellina, with a nature-inspired theme.